Curious city-dweller Juliet Martinez and reporter Annie Minoff do their best to follow their noses to track down the mysterious scent. South Kilbourn Avenue runs alongside the industrial western edge of Archer Park. It draws a distinct different in usage for either side. 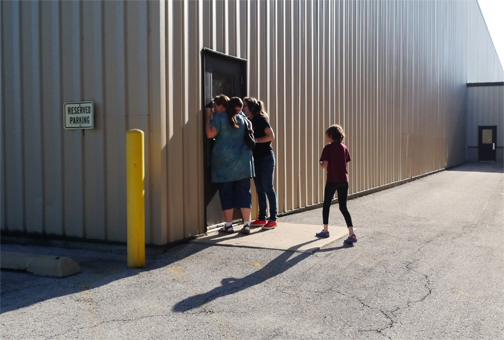 Sniffing outside the vents at Home Products International Inc, we look for a place to ask employees about a smell. Field olfactometry practice with students trying out Nasal Rangers. Paula Martinez plays with putty. We brought it along on the investigation to remind our noses of the scent we were tracing. Juliet Martinez is the first to admit she’s “olfactory-oriented.” Ask her about living in Chicago and she responds with a catalogue of smells. It’s a gorgeous Friday afternoon in July, and we’re walking through Archer Park with Diego and Juliet’s nine-year-old daughter Paula. We’ve gone in search of Juliet’s latest smell interest, an odor she noticed last fall when Paula was taking tumbling classes at the park. While Paula practiced forward rolls, Juliet and Diego killed time at the playground. And that’s where she smelled it: the unmistakable, nostalgic odor of Silly Putty. Haven’t heard about Silly Putty in a while or maybe never? Well, it’s the putty that bounces, stretches, and (most bizarrely) snaps when given a blow, and it comes in a plastic egg. According to Juliet, it also has a distinctive “plastic-y chemical type of smell.” It’s this smell she recalls wafting over the playground from Archer Park’s industrial western edge on those fall evenings. In a city of thousands of smells, Juliet asked us about just one. But our search for this one smell would bring us nose-to-nose with the immense challenges of keeping an entire city’s odors in check. In pursuit of putty, we’d learn how noxious neighborhood odors get “official,” how smell mysteries are (sometimes) solved, and how a smell’s capture can involve ridiculous looking nasal enhancements. And we’d gain a newfound appreciation for the city’s odor investigators: those hardworking men and women on the front lines of city stink. At Archer Park, our effort to answer Juliet’s question faces one immediate setback: the Silly Putty smell is nowhere to be sniffed. Juliet has a hunch: “In the fall, pretty much the main wind comes from the West, Northwest. I think it just blows right over those factories over there, and washes the park in the aroma of Silly Putty.” Today the air is still. So we decide that if the smell won’t come to us, we’ll go to it. Silly Putty eggs in hand, we head towards the park’s northwest edge, in the direction of those autumn winds. You can think of Archer Park as a buffer between the single-family and two-flat homes to its east and the railroad lines and factories to its west. 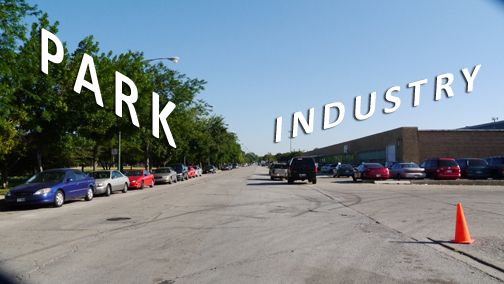 On the western side of South Kilbourn Avenue, industrial blond-brick buildings sport non-descriptive names like “Skolnik Industries” and “A. Lava & Son Co.” We begin our Silly Putty search at “Cotton Connection,” a decidedly odorless t-shirt warehouse where a few hungry employees are observing the final hours of their Ramadan fast. No smell here the office workers say, but maybe check out the mattress manufacturer next door? At A. Lava & Son, things get a bit smellier, but not much. We head into the facility’s open loading area and Juliet spots a box filled with cut fabric. She holds up a handful of scraps and takes a whiff. At last, we trek one business over to Home Products International Inc. A trucker loitering in his cab tells Curious City producer Jennifer Brandel that Home Products makes plastic bins. As we round the building corner looking for an entrance, Paula pipes up. Just a few paces away from the vents: nothing. But as we approach the warm air blasting out of the building’s side: something. Juliet says she’s getting “that strong kind of petroleum-like component” and an undertone of alcohol. Then she takes a deep breath. “I feel like this is it,” she says. We pass through a factory filled with huge machines (and yes, a lot of plastic bins) only to find that the office staff has left for the day. Inside, the astringent, chemical smell is moderately stronger. Is it our Silly Putty smell? Juliet’s confident, but not certain. Our search — promising as it is — raises a good question: Could this “sniffing around” really be how professional smell investigators do it? The answer is both “yes” and “no.” Otis Omenazu is Chief Air Engineer at the Chicago Department of Public Health, the agency tasked with addressing odor complaints in the city. While the investigative process he describes is not wildly different from our Archer Park sleuthing, it is more systematic. CDPH receives most of its odor complaints via 311, the city’s non-emergency hotline. Complaints range from vague (“Chemical odors in the area”) to specific (“Caller states that smell coming from restaurant barbeque wood charcoal is too strong”). Smell complaints submitted to Chicago&apos;s Department of Public Health between Aug 1, 2012 and today. Press the bullet list left of a record to see that record&apos;s details. While the department’s goal is to address complaints within 24 hours, Omenazu admits there’s a certain amount of triage that happens. Gas, chemical smells, and anything that’s causing people to feel sick, “that’s priority number one,” he says. And then there are complaints like the one Omenazu got last week, from a man claiming to smell the asbestos removal happening fourteen floors below his apartment. “How do you smell asbestos?” Omenazu demands, incredulous. “It’s just like sand. It’s a rock! It doesn’t smell!” He’s smiling, but quickly checks himself. And, judging by the numbers, they do: Omenazu’s department has investigated approximately 200 odor-related complaints so far this year. How do odor investigations work in Chicago? City inspectors carry portable gas meters called EntryRAEs capable of detecting dangerous volatile organic compounds such as chlorine, methane, and carbon monoxide. There are other means of determining a smell’s provenance, though, according to expert sniffer Dr. Alan Hirsch, the Director of Chicago’s Smell & Taste Treatment and Research Foundation. Given an air sample, a gas chromatograph can reveal a smell’s constituent chemical elements. But this is dubiously helpful, Hirsch says, when you don’t know what smell the chromatograph’s chemical analysis corresponds to. The hilariously named Nasal Ranger on the other hand, can provide scientists like Hirsch with precise readings of odor strength in the field. What it won’t do is tell them what the odor is. From Hirsch’s vantage, we need better noses, not necessarily better instruments. His favorite method of smell investigation is the “smell panel,” whose members rate smells by hundreds of different parameters (musty, moldy, etc.) and compare mystery smells to known odors such as rose or cinnamon (or Silly Putty). In the subjective world of smell, that broad definition sometimes has unexpected consequences. Take the West Loop’s Blommer chocolate factory. Being bathed in the factory’s fresh-ground cocoa scent may be a highlight of my daily commute, but not everyone is similarly enthusiastic. “There were some people who were really irritated by the smell of chocolate everyday, and we could sympathize with that,” Omenazu says, recalling the city’s 2006 cocoa crackdown. “We had to work with Blommer’s in this case to employ some … engineering controls to make sure that people [were] not inconvenienced.” Blommer used a baghouse (a particulate filtering system) and Omenazu says the number of chocolate-related complaints has fallen. For CDPH, this is the best-case scenario. Businesses that fail to comply with environmental code can face hefty fines. All this assumes of course that the city’s odor detectives are successful in tracking down an odor’s source. What happens, I ask, in cases like ours where investigators show up only to find that the smell has left the building? Omenazu says this happens a lot, and unfortunately, there’s not much the city can do. The smell strikes back … Does Juliet? As she tells me the next day, she was driving down Kilbourn Avenue, with her car windows open, and got a big ol’ whiff of putty right outside Skolnik Industries. Near Skolnik shipping and receiving, Juliet had found “Danny,” a self-described Skolnik welder, taking a smoke break. She captured the moment (and his comments) on her phone. “That smell that you smell,” he said. “It’s from the weld, from the federal welder.” And the aroma, he agreed, is like Silly Putty. Danny told Juliet that Skolnik Industries produces steel drums, the kind used to contain toxic waste, for example. On the phone, Howard Skolnik, the company’s President, confirms this, but he denies that the welding and painting the company does creates an odor. As for Juliet’s Silly Putty suspicions? “I have no idea what she’s referring to,” Skolnik says. Perhaps this is simply a case of a businessperson protecting his interests, but when I speak to CJ Sikora, an industrial welding instructor at Daley Community College, she agrees that Skolnik could be right. Certain kinds of small-scale welding (probably not the kind going on at Skolnik) can create localized fumes, Sikora says. But nothing you’d smell a block away. And then there’s the fact that we couldn’t independently confirm that Danny works at Skolnik. After one tantalizing clue, our smell trail has once again gone cold. Again, when Chicagoans face weird odors, they have two options: call 311 and register an odor complaint, or shrug it off. 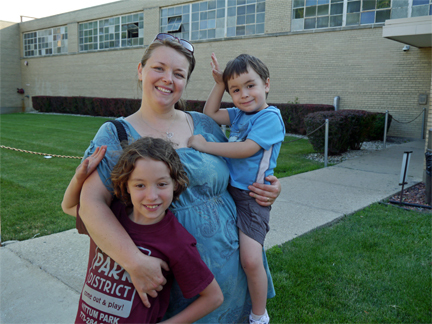 Juliet’s still curious about Archer Park’s Silly Putty smell, but she hasn’t complained to the city and doesn’t plan to. Juliet Martinez has made her own kind of peace with the putty. Happen to live or be passing through Chicago’s Southwest Side? 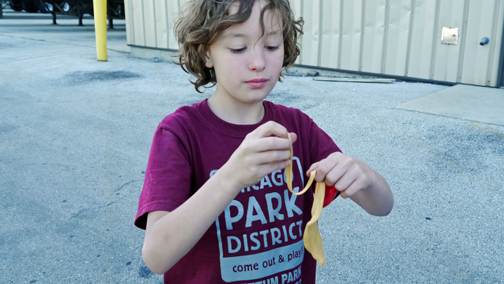 If you have Silly Putty smell leads, send them to us: curiouscity@wbez.org.